Murdering aside, I am more interested what happens when mixed-gender small group work and live together in an isolated confined extreme environment. Away from everyone else, this group essentially constitutes a micro society. But is this micro society immune from social forces, such as structural inequality and stereotyping that shape societies at large? Do stereotypical knowledge and perception of ability based on who one is (and not what they actually know) impact how isolated crews make decisions and complete tasks? Do stereotypical beliefs lead to a formation of informal status hierarchy in these crews? A substantial amount of evidence from newly formed and long term work groups demonstrates that visible status cues contribute to status hierarchy formation net of actual abilities related to the task. In other words, people tend to utilize stereotypical knowledge of others’ abilities based on their gender, race, ethnicity and other status characteristics. For example, in our society men are seen as more capable in the majority of tasks – be that changing a tire, or being a head chef in a fancy restaurant. When one thinks about a leader, one thinks about a white male. In task groups, individuals who are perceived as having higher abilities in general, are also seen as being more competent in the task-at-hand. Consequently, they will be encouraged to be more proactive to solve relevant problems and to handle the said task. They will also be assessed by other team members more positively, and will have more influence in making a decision. It is a self-fulfilling prophesy: we know who should be better at a task based on our stereotypical knowledge, especially if we do not know the person, and then we let them lead our group and contribute more to the task. But even if we know actual abilities, stereotypical knowledge still plays its part. A study of people who have been working together for a while found that gender still had a significant impact on an individual’s status in a group, despite their past performance. So, we know that people like to stereotype. And we keep thinking that a man should do the job, even if a woman has proven in the past that she is pretty capable – at least to some extent. What about astronauts in space or scientists in Antarctic winter stations? It is hard to argue that their working environment is pretty different from an ordinary office space, where these studies were conducted – not to even mention extensive psychological testing and preparation they have to go through prior to a mission. But existing evidence points that women still have harder time than men – for example, women who have wintered in Antarctica have reported differential treatment, work place animosity, and even sexual harassment. Is it possible that informal status hierarchy, based on stereotypes, persists even after extensive training and living together? Most of current research on heterogeneous crews in space and space analog facilities (think – Antarctic winter stations) focus on personality-level explanation, and overlook the socio-cultural baggage that everyone comes with. And that is where I come in. My first step in understanding how gender impact informal status hierarchy formation in small isolated crews will be secondary data analysis from the Mars DesertResearch Station (MDRS) archives. MDRS is a space analog facility in Utah owned and operated by a non-profit organization Mars Society. Each year, MDRS hosts an eight month field season for professional scientists and engineers as well as college students of all levels, in training for human operations specifically on Mars. Most missions are 2 weeks in duration. To this day, over 190 crews have conducted their research on the site over the course of 16 field seasons. For this research project, I will analyze daily logs from a random sample of crews. analyzing daily reports from randomly selected crews. Rotating crews at the MDRS station are task-oriented groups who try to accomplish specific simulation goals. Individuals who are perceived having better skills and abilities will have higher in-group status and will be more instrumental at achieving the simulation goals. 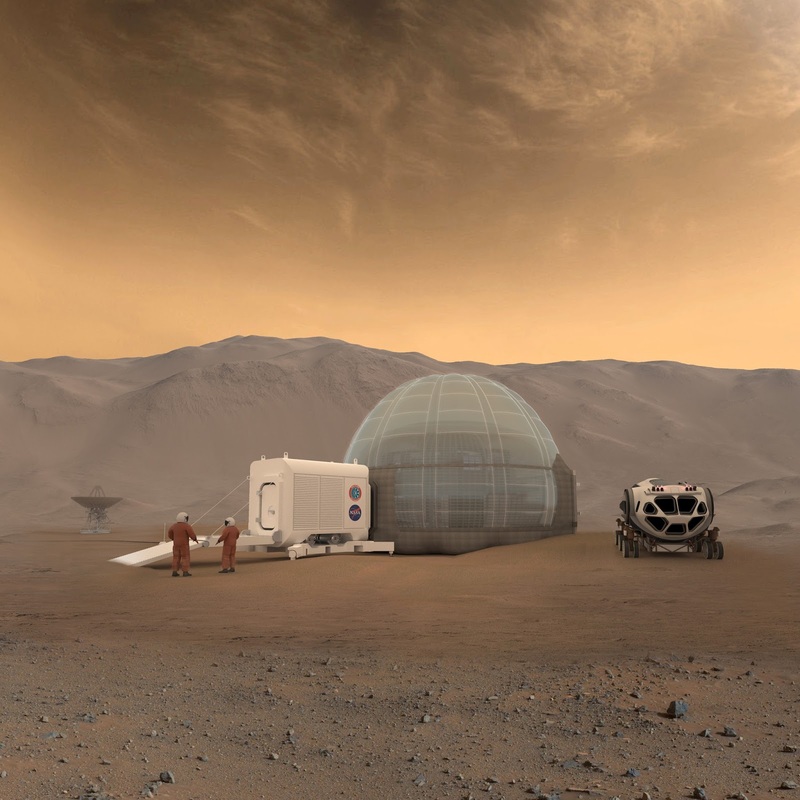 Extravehicular activities (EVAs), or moonwalks, are a crucial part of Mars habitat simulation. I think that crew members who are seen as more important to the mission will be more likely to perform more moonwalks on average, and with more people. If we know who went on moonwalks with whom and who did it more often, then we can have a glimpse (albeit imperfect) to this crew’s status hierarchy. I will use social network analysis to graph EVAs in each crew and to see who has more central role in a crew – a male or a female. In an (simulated) example below, we see a mixed crew of six people. Red is a female; blue is a male. Each node is a person; a thicker tie means that these people went on more moonwalks together. “C” marks the most central person in this crew. 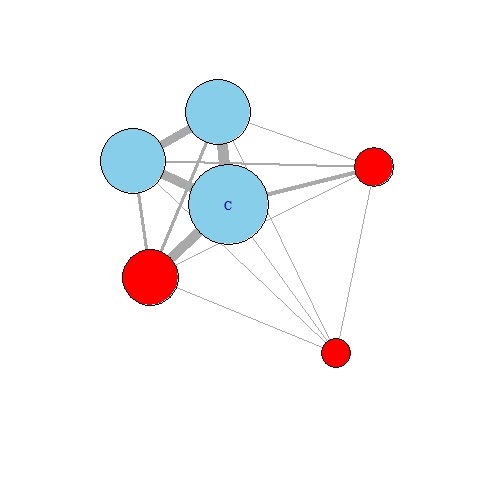 This summer, I will create more elaborate animated network graphs. I will make it possible to select different sociodemographic characteristics and to map crew’s moonwalk patterns according to them. Why? There is always a possibility that status hierarchy is formed not because of gender differences, but simply because crew members have different roles. For example, maybe the crew captain will always be the central person, regardless from their gender. Or maybe people with PhDs will be more likely to put on a space helmet than other individuals. In addition to interactive visuals for a close exploration of crews’ social networks, I will also run statistical models to quantify gender influence on status hierarchy formation, net of other characteristics. This will be the first step of many to explore how gender impacts small crews in a structural way.